Before Black gives atari, White has two liberties and Black has a cutting point at a. 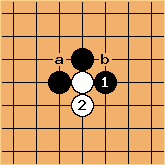 After Black's atari and White's extension, White has three liberties and Black has two cutting points, a and b, to worry about. The following diagram illustrates the problem. 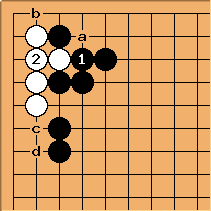 It feels good to make forcing plays, but often the result is to strengthen the opponent's stones and to weaken our own. 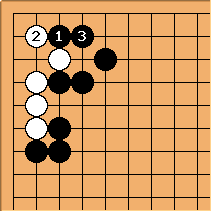 The hiki of the tsuke-hiki combination is a good shape move. Black can peep there and and kill with b next.. 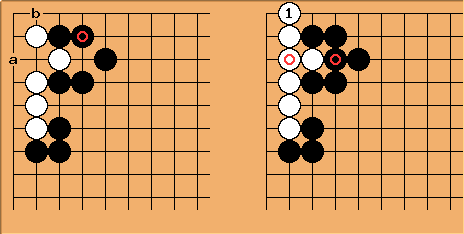 Right: The weakness has been removed in sente and White can now play . Bill: Once I dropped by a Go club in Kyoto when an 8 dan was giving a class. I sat in. In critiquing an amateur game he said, "Atari! Atari! It feels good, but maybe it's not so good." it's superfluous, aji keshi; hence detrimental. If atari was given too early - often one regrets later not to have the possibility to give an atari from another side or to another stone.